About a year ago, James and I went to a psychic. We happened to be in the Carytown area where this psychic festival was underway. Described as “one of the largest gatherings of psychics in one place,” our interest was piqued. When we went inside the designated building, an overwhelming amount of psychics sat at their tables. Each touted a different background — Some claimed to see the future, others were palm readers, pet whisperers, health and wellness psychics, and only one tarot card reader. Because James is fascinated with psychics, I let him choose the one we would see. He chose the tarot card reader. We sat down with the young man who, if I remember correctly, was named David. He was how I’d picture a male psychic — laid back, soft-spoken, curly long hair. He began by explaining tarot cards do not portray future events… so if we wanted to know future information, we were at the wrong table. Tarot cards, he said, show what is happening in our life right now; some of what is highlighted may seem like common sense, but others shed light on aspects we may not have thought about… and it’s those cards he encouraged us to deeply ponder. There were a few things that stuck with me after our psychic reading, one being a card he flipped for me. It was the Tide card. He told me the card illustrates my life and how it resembles the tide — one minute, I’m propelled forward, shoved towards the shore with everything moving at a rapid pace… then, in the blink of an eye, I’m pushed back, pulled out to sea. This was true, and on days like today I do envision myself as the tide… looking ahead, watching people — the waves — thrash towards the beach… while I am tugged backwards, backwards, caught in the tide. On Monday, James went with me to get lab work done. I never heard of LabCorp… and what little information I knew was from the title which I assume stands for Laboratory Corporation. I knew they’d perform tests on me to determine why my vision is going in one eye… but I hadn’t given much thought as to which tests would be done. James and I were getting ready to leave when it occurred to me — I should have thought more about my tests. “James? What tests do you think they’ll do?” “Well…,” he hesitated. “I assume it will be…,” he hesitated again. 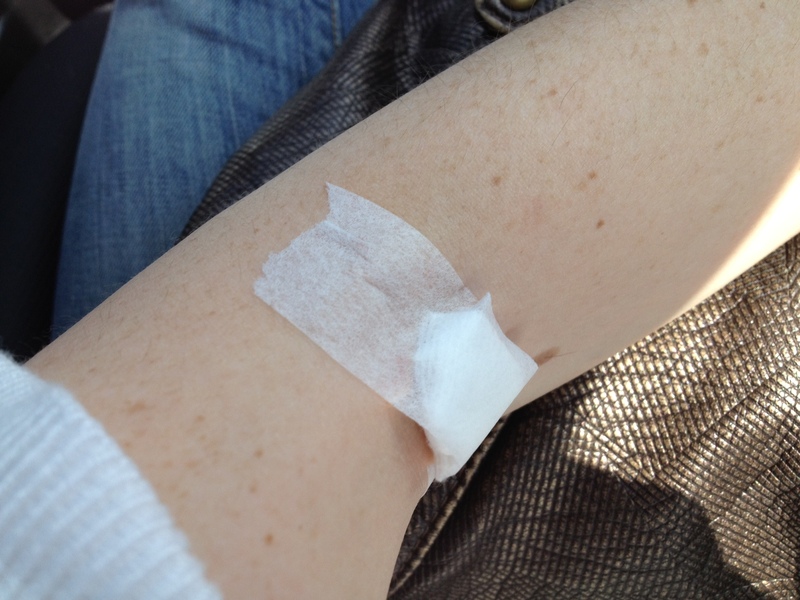 “…blood work.” He knows I hate that word — Blood (and it will be the last time I say it here). I like to refer to it as liquid or fluid — some abstract word that can have multiple meanings or nothing at all. I tried to put his answer out of my head… unsuccessfully though because when we got into the car, I looked at the paper, hoping for answers. “Blood work” was written in fine print under the map, showing the location we were headed to… and on a second sheet of paper my optic neurologist gave to me, the words “Tests include” were printed followed by a colon. “James, look. Here are the tests I’m going to get done…” and we looked, trying to figure out the elongated, puzzling foreign language. Unable to make sense of the test names, we counted — One. Two. Three. Four. …Five. …Six. …Six tests. I dropped the paper, disgusted. When we arrived, the small LabCorp room was packed. People were sitting in every chair, sitting cross-legged on the floor, standing — all waiting for hard-to-pronounce lab tests. I checked in, sat on an end table, and we waited. I felt like oxygen was leaving the room. With each person called up, I tried not to envision what was happening to them. It seems like since this eye stint, I am forced to face some of my largest fears — needles, fluid, tight spaces. The only thing missing are mosquitoes and public bathrooms. “I think I want to leave,” I told James. “You can’t, babe. You have to stay.” I considered going against him. Really I did… but in the end, I knew it wasn’t his decision to keep me there. And yet, here he was, getting lack of sleep, just to support me. I now needed to support him. After about 45 minutes, my name was called. I grabbed James’ hand and made it clear he was not to wait in the waiting room, but come with me. In the room, I saw a chair, ready for my taking. I sat. The woman explained I had a lot of tests that needed to be done. I tried not to speak, to concentrate on anything but her and what she was about to do. I saw her grab a needle, then grab one, two vials… a third… another… and that’s when I turned my head, not counting anymore. “This is a lot of vials you need to fill,” she laughed, but not meanly, more out of surprise or pity. Long story short, I was poked once, but enough to fill six vials with liquid. Six. I left feeling as I felt when I came in — nauseous and light-headed. One thing down though. More to go. All week long, I’ve waited for a call back from Doctor Thurston’s office or from the MRI people, telling me where and when my MRI would be. I say “all week long” because its felt like a full seven days, but instead it’s only been two business days. Still, I was told my MRI would be scheduled Monday or Tuesday… and those days have come and past. No calls, no explanations. I was also waiting for my MRI prescription to be sent to CVS… which is highly needed because I’m claustrophobic. I called CVS Monday to check if it had come in. “No” was the answer. I called again yesterday. “Has my prescription come in yet?” “No,” the answer again. It’s an odd feeling to know your life is moving rapidly by you, but your body feels stuck in one spot, only watching events unfold. I see myself holding a microphone, reporting live for work. I see my fiancé standing in the grass, wearing a black tux, looking handsome, waiting for me to walk down the isle. Then, I see us — pointing fingers in two different directions at two walls, debating which surface the sofa should be adjacent to in our new home. All moments on a conveyor belt, slipping by me while I stand still. I ended up calling Doctor Thurston’s office both days, wanting an explanation about why there was no explanation. Wanting to know when my MRI would be and when my prescription would be faxed over. I finally reached someone, but was told their computer system was still being upgraded… which basically meant their fax machine was not online. Because my family had been worried about my impending health verdict, I called my dad to give him an update. “Why don’t they just call it in?” he questioned. I don’t know. Why don’t they? I called back and left a voicemail with the secretary, explaining for the second day in a row, my prescription had not arrived and that, if it was because of the computer upgrade, could they revert back to the old-fashioned way of calling in my order? Within an hour, CVS called, saying my prescription was ready for pick-up. That made me feel somewhat better. Claustrophobia may be relatively avoided. It’s crazy to think how much our society thrives on medicine. Whenever I hurt myself when I was small, my mom would always ask, “Do you need a Band-Aid to make it feel better?” Tears about to fall out of my eyes, I would nod, never refusing a Band-Aid. She would rush to grab the fail-proof cure and stick it on me gently. “Does it feel better now?” she’d ask, knowing the answer. An instant smile and second nod of the head. It never mattered that most of the time, my pain wasn’t from a cut or exterior wound. In never mattered that I only had a bruise or a pain inside my body. The Band-Aid always made it better. This MRI medicine was my Band-Aid. Don’t get me wrong; my claustrophobia is very real, but maybe, if I tried hard enough, just maybe I could convince myself that these pills would allow me to lay through an hour MRI. Tuesday evening I got a call from Doctor Thurston’s office. His secretary explained part of my lab tests had come back. They were for my kidneys… which were functioning fine. While I know I should be happy, my kidneys working adequately was the least of my worries. Later that night, the elusive MRI people called. “Your MRI is scheduled.” “When?” I asked. Late Wednesday. That’s the time they could squeeze me in. “Okay,” I said through exhaled breaths. “I’ll take it”… as if I were at an auction. I couldn’t sleep last night. I kept imaging I was on a warped game show. I could hear the crowd cheering, see the host standing next to me, mic positioned under my mouth. He smiles, his eyes wide with excitement. In his other hand a glass bowl with two pieces of paper inside, folded the same way. “Pick one,” he begs. Just one. I stand, frozen. Our time was narrowing. I attempt to raise my hand, but he jumped ahead of me, reaching in and snatching up a piece of paper. He unfolds it. “Your fate is…,” he says. Then, a commercial break.